Not many know that while the North of Nigeria is plagued by terrorism, the country’s South is plagued in another way. In Nigeria beautiful, innocent children, as young as two years of age, are abused, tortured, abandoned, mutilated, killed by their own superstitious parents and relatives. Self-styled deliverance pastors, prophets and prophetesses, thirsty for cash in a land stricken by poverty and superstition, have over the years branded thousands of children as witches, and thus they share in the blame for many deaths of the innocent. And yet the church establishment and the government in Nigeria do not do much to stop this awful crime, almost amounting to genocide of children. Those who are trying to help are not many. In the past ten years there have been only a few international organizations, and a handful of people that have undertaken a noble mission of trying to save as many of the condemned children as possible. Some have given up in the process due to challenges and opposition. One organization though that has been actively saving young lives in Nigeria since 2010 is a Brazilian organization “Way to the Nations”. Read this letter released one day ago by Leonardo Rocha Dos Santos, the founder and director of the “Way to the Nations”. The year 2014 was very hard for our team in Nigeria. We had to face the worst financial challenges since we started our projects five years ago, but thanks to the generosity of our friends in England, France, Switzerland, Canada and Australia, we were able to organize a number of fundraising events that helped us to raise needed funds. With those and thanks to our friends in Brazil we were finally able to complete our rent payment in December, after one month of delay and threats by the estate agent urging us to vacate the property if we were not able to honour the contract. You can imagine what would that mean to the children in our care. Our trustees in Nigeria were seriously considering to transfer one half of the children to a new organization that was recently opened, and the other half to the government’s children centre that looks more like a prison for teenagers than a safe home for children. I know that place and I refused even to think about such an outcome. Although at this time we are unable to help the children of the Northern part of Nigeria, who are suffering at the hand of terrorists, it would be tragic if we would have to close the work that has been growing successfully in Nigeria for the past five years. The impact of our work in the lives of the children in the South of Nigeria, those children we rescued, the ones we have helped, and on the children we are still be able to save, is something that has kept my team and me fighting for our children and our centre. Three weeks ago I was going through the last term school results of our children. Out of the 23 results I received, although one child failed, 9 of them were among the top students of their classes, and other 5 among the ten best students. In other words 60% of our children were among the best in their class groups. 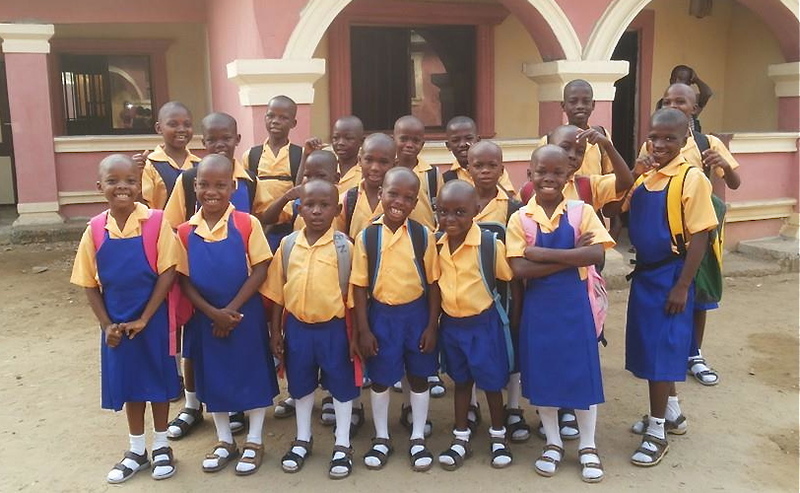 If we consider the delay they have had in their development before they came to us, and the traumas they are still carrying with them, the work that is being done by our Nigerian team, with the help of a tutor whom we have hired, is achieving outstanding results. Two weeks ago, while still in the middle of our current financial crises, when we did not have enough money even to buy food for one week, we received a call from the local police asking us to rescue a 12 years old girl called Marry. Her family accused her of being a witch. She was severely beaten and abandoned to the streets where she was abused by two boys. The boys were caught by the police, but due to “lack of evidence” they were soon released. Then Diana, our local director, called me and asked what they should do about the request having in mind that we were already struggling how to feed the children we have. My answer was, “You know what I would do, but I will leave the decision to you since our financial struggle is harder on you who have to face the children every day and suffer for not being able to provide all we have committed ourselves to provide”. Two days later Diana called me again and told me they had rescued the little girl. May our good God enable us to restore joy in the life of Marry, register her in a school, and help her to restart her life. Fortunately at this time we have five Brazilian volunteers at the centre that will give our new daughter attention and love she needs. Finally, let me share about the most recent case. Gloria, a fifteen year old girl was branded a witch by her own family, who we were monitoring for several months until we decided to withdraw her from her home, after she suffered aggression last November. No one of us knew, not even herself, that at the time when she came to our centre she was pregnant with her elder cousin who used to go to her house to get some food. One week ago, when she found out that she was pregnant, instead of sharing it with us she asked us to let her go to visit her mother. There, in her village and with the help of her mother she went to see a nurse to help her with the abortion. Meanwhile, at the orphanage, a girl who Gloria had confided her plan with decided to share it with Mfon, our Child Development Officer who rushed to the village. When our team arrived at the village Gloria was still at the nurse’s house but it was too late because she had already taken the abortive solution. Our team begged her not to do that and her mother told us in a very offensive way not to get involved. Our team had no other choice but to return to the Centre. From the nurse’s house Gloria tried to go to her father’s house, who again didn’t want to accept her. Then she went back to her mother who for fear of having a witch at home also did not let her in afraid that she would become cursed. Then, starting to have excruciating pain she ran back to our centre and fainting knocked at our door. Our team rushed her to the hospital, and a doctor checked her and said that her baby was dead and she needed an evacuation of the foetus, which would have to be paid before the procedure was done. Diana immediately borrowed some money and paid for the treatment. Now Gloria is much better and due to be back to the orphanage soon. If it were not for the help of our team Glora would have been dead by now. Every day we see media presenting the news from Nigeria with the scenes that look like from some horror movies. Although we are lately receiving statistics from various sources that Nigeria is economically improving, those who know better have a more sobering view to share. They say that things in Nigeria will get worse before they get better. This is the year of elections in Nigeria and I too am not overly optimistic. But regardless, our team is determined to go on. Today in our children centre “Factory of Hope” we have 36 children, ranging between newborn babies and 17-year-old teenagers, and all of them need much love and care. The names of the two girls have been changed for the protection of their identities. Listen to this interview I made nine months ago with Leonardo Rocha Dos Santos, the founder and director of the “Way to the Nations”, which graphically illustrates the disturbing blanket of darkness that veils the country of Nigeria. Interview transcript. This entry was posted in Africa, Appeal, Current Issues, Faith and tagged Africa, Appeal, Brazil, child abuse, Factory of Hope, Leo Santos, Nigeria, Saving Witch Children, superstition, Way to the Nations, Witch Children. Bookmark the permalink.